For the crater, see Grindavik (crater). Grindavík is a fishing town on the Southern Peninsula of Iceland. It is one of the few cities with a harbour at this coast. Most of the inhabitants work in the fishing industry. The Blue Lagoon, Grindavík's premiere attraction, is located 3 miles (4.8 km) from the town centre. Grindavík from the air in May 2011. Landnáma or The Book of Settlements mentions that around 934 two Viking settlers, Molda-Gnúpur Hrólfsson and Þórir Haustmyrkur Vígbjóðsson, arrived in the Reykjanes area. Þórir settled in Selvogur, and Krísuvík and Molda-Gnúpur in Grindavík. The sons of Moldar-Gnúpur established three settlements; Þórkötlustaðahverfi, Járngerðarstaðarhverfi and Staðarhverfi. The modern version of Grindavik is situated mainly in what was Járngerðarstaðarhverfi. A short distance to the north, there is the Blue Lagoon (Icelandic: Bláa Lónið), a geothermal spa using hot and mineralized waters from the nearby Svartsengi power station. Ungmennafélag Grindavíkur (Umfg) is the town's sport club, and the town contains the Grindavíkurvöllur stadium. The Leif the Lucky Bridge spans the Álfagjá rift valley that marks the boundary of the Eurasian and North American continental tectonic plates. It was built in 2002 and named in honor of Icelandic explorer Leif Erikson, who travelled from Europe to explore North America 500 years before Columbus. The Icelandic Saltfish Museum in Grindavík opened in 2002. It displays the story of salt fish production and its importance for the Icelandic economy throughout the centuries in a specially designed building of 650 square metres (7,000 sq ft). The Icelandic writer Guðbergur Bergsson was born here, and Kalli Bjarni, the first winner of the Icelandic version of Pop Idol, lives in the town. The Spanish publisher and writer Jaime Salinas Bonmatí, engaged to Guðbergur Bergsson, lived, died and is buried here. Icelandic footballer Alfreð Finnbogason was also born in Grindavík. Near Grindavík, the United States Navy operates Naval Radio Transmitter Facility Grindavik. It uses several antennas, including two guyed masts. The mast situated at 63°51′1″N 22°28′0″W was built in 1993 and is 304.8 meters tall. The other mast at 63°51′3″N 22°27′6″W was built in 1983 and is 182.9 meters tall. The taller mast replaced a 243.8 meter tall mast, and the second replaced a mast of same height. ^ Iceland Review. H.J. Hamar. 2005. 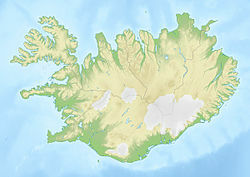 Wikimedia Commons has media related to Grindavík. This page was last edited on 11 March 2019, at 17:35 (UTC).